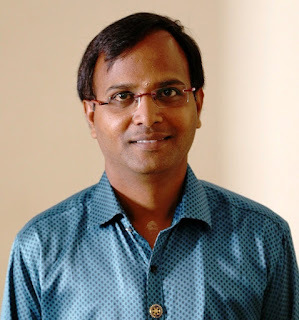 By Mr. S Rajasegarane, Financial Advisor, Pondicherry. 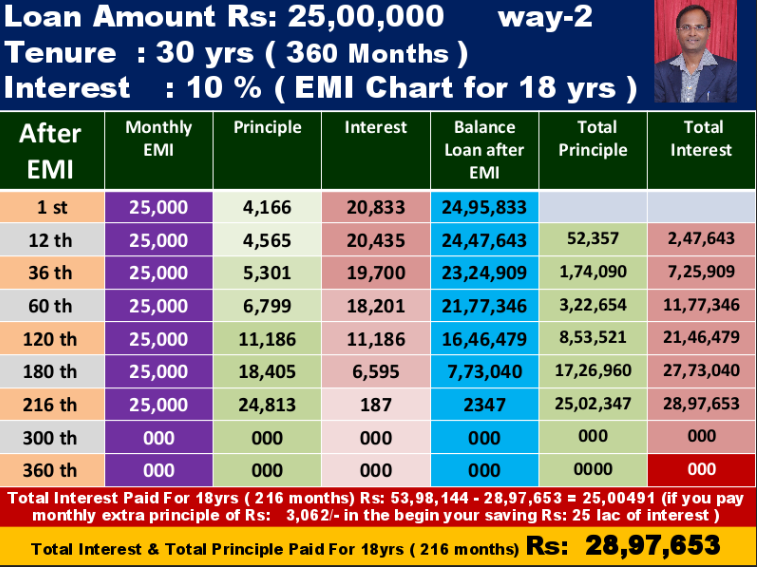 Most people choose the EMI option to repay home loan because they can not come up with the huge amount in one payment. Also, they choose this option to avail of income tax (IT) exemption. It is also true that most people are keen to repay the loan amount quickly. Even though the repayment term chosen may be 15 years or / 20 years, statistics show that most people make the loan repayment in 8 years. 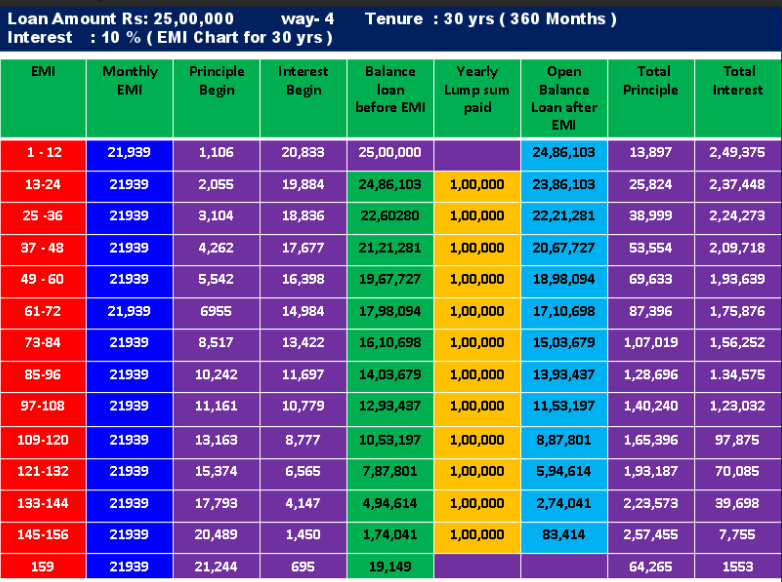 It is true that if you stick to the EMI schedule and repay the loan over a long period (15 years / 20 years / 30 years) the interest component is very high. The loan amount is Rs. 25 lac but with the interest amount you end up paying almost Rs. 54 lac. The repayment schedule is made clear in the first table of Appx.1. The EMI amount is Rs. 21,939. The Equated Monthly Installment (EMI) amount has two components, Rs. 1.106 towards repayment of capital and Rs. 20,833 is towards repayment of interest. Instead of Rs. 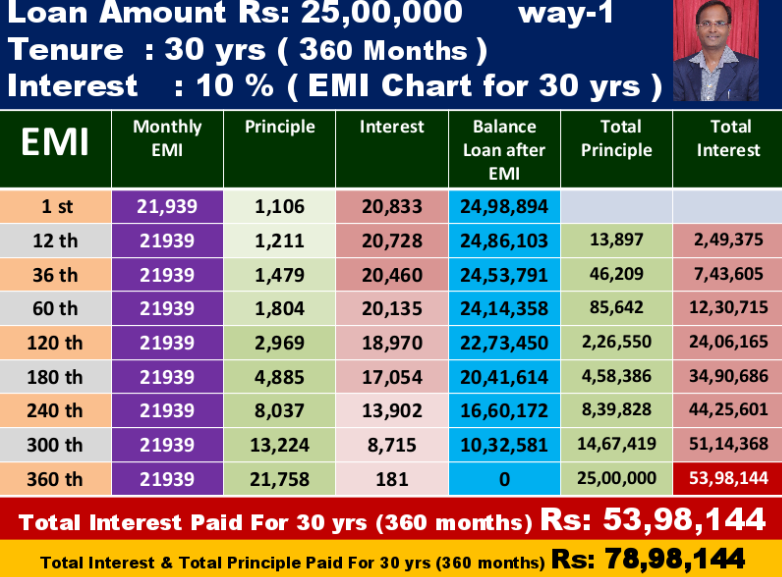 21,939 every month increase EMI by Rs. 3,061 to Rs, 25,000. By doing this you will be able to finish the home loan repayment after 216 months. Increasing the EMI amount from the 2nd year onwards..! In the first year, pay the EMI as per original schedule. 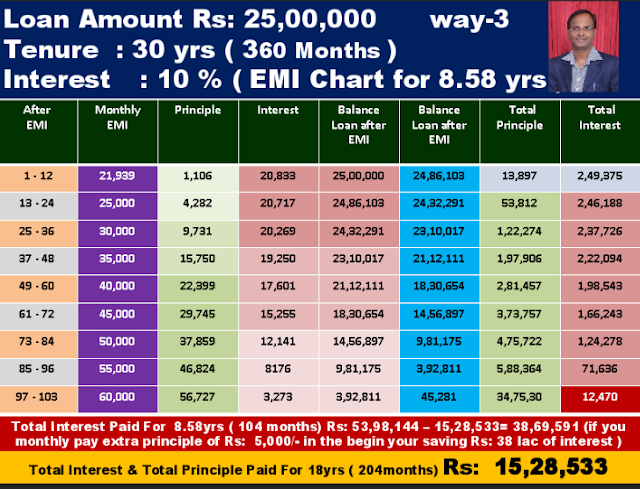 From the 2nd year onwards, increase the EMI amount by Rs. 5,000 every year. Now you will see that the home loan repayment is over in 103 months instead of 360 months. The amount that goes towards interest is only Rs. 15 lakhs approximately. Adding a big amount to the yearly repayment after Ist year.. Here, You stick to the EMI schedule but add a bigger amount every year after the 1st year. For example, you pay Rs. 1 lakh per year towards capital repayment, from the 2nd year onwards, in addition to the EMI of Rs. 21,939. This way the home loan repayment is over after 159 months. The amount you pay towards interest is only Rs. 19.21 lakhs and you save Rs. 34.77 lakhs on the interest component. ( See Table 4). Choose the option best suited to your financial profile and aim to take full possession of your house at the earliest, without paying a huge interest on the borrowed amount.